We took the evening flight to London Heathrow on Wednesday and arrived in cold and gray London. Early the next morning, we set off for London’s oldest market – Borough Market which is located near the London Bridge tube station. We had never been and had heard so many wonderful comments on the market that we knew we had to visit it. The market has been around since AD 43 when Roman legions arrived in the city. The original market expanded until 1671 when the boundaries of the market were at Borough Hill Street and London Bridge. The original market was abolished in 1756 and a new one was built on the current site. Borough Market recently celebrated 250 years of trading is an excellent place to see, smell and taste the best produce that Great Britain has to offer. 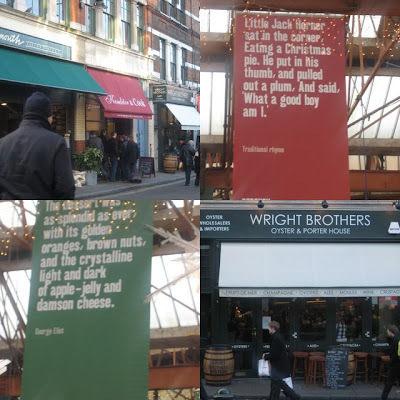 Borough Market is large and is spread out over four areas – Crown Square, Green Market, Jubilee Market and the restaurants and shops in Stoney Street, Park Street and Bedale Street. It was a cold day and right after breakfast, we set out for the market taking the tube at Green Park and getting off at London Bridge. We walked around the area of Crown Square and Stoney Street and it was a wonderful gourmet sightseeing tour of fantastic produce – from butchers to fishmongers to bakers and cheese makers. There were also stands with fresh fruits and vegetables, one just for French dairy products, another with freshly-hung game (hare, pheasant and guinea fowl), charcuterie, dried fruits and even one selling truffle oil where two jars were filled – one with fresh white truffles and another with fresh black truffles along with a sign that said “smell me” so clients could actually experience the distinct odorous difference between them. We had tried to reserve a table for lunch at roast but were unable to due to the many Christmas lunches booked. roast has a fantastic location right above the market with the bar and tables giving diners a bird’s-eye view of the stalls below. The restaurant is in Floral Hall , a cast-iron and glass building completed in 1860. The weekly-changing menu features modern British cuisine and the chef works only with produce that’s available at the market. Right near the entrance is roast to go which is open daily till 3:00 p.m. and serves assorted sandwiches, coffees and drinks. One is spoilt for choice with the amount of food stalls and restaurants – there’s an upmarket fish and chips diner simply called fish! with a specialty fish and seafood menu, there’s Tapas Brindisa in a converted potato warehouse which also has a stall selling specialty food items and wines from Spain. Along Stoney Street, there are numerous gourmet food shops, some of which even have counters and a few tables for diners. Around there as well are Neal’s Yard Dairy, the traditional oyster and porter house Wright Bros., patisserie Konditor & Cook and wine bar and shop Bedales Ltd. which was recreated as the Greek restaurant in the film Bridget Jones Diary where Mark Darcy (Colin Firth) and Daniel Cleaver (Hugh Grant) had a fistfight. The door to Bridget Jones (Renee Zellweger) apartment is actually across the street from the wine shop. There was even an episode of Market Kitchen being filmed with guest chef, Jun Tanaka, actually chopping and cooking right there. After circling the market several times deciding what we could buy, we decided on some cassoulet with confit de canard from a little stall specializing in French products. The trip to Borough Market was so worth it, the only thing we should have done was visit it hungry so we could have tried some gourmet food at one of the fantastic smelling and looking stalls at the market. Every trip to London should include a visit to this wonderful, historical and gastronomic attraction. 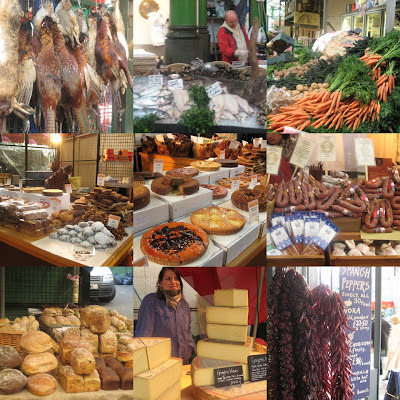 Off to Borough Market again tomorrow and will have a look at the Pub plus Brindisa and Monmouth Coffee. One other thing that this author left out is The Market Porter Pub. It is located just across the street from Roast. It has a great range of ales and lagers that cannot be found in many other London pubs. It is also famous because it was one of the only pubs in London to open very early before the 24 hour licensing laws came into effect. The reason for this was to cater to the market traders who worked odd hours at the market itself. Happy drinking!